produced in association with the John S. and James L. Knight Foundation. Most Americans, including more tech-savvy adults under age 40, use a blend of both new and traditional sources to get their information. Americans report watching local TV news than any other source—but for just a few topics—mainly weather, breaking news, and to a lesser degree, traffic. Younger adults, moreover, rely on local television less. 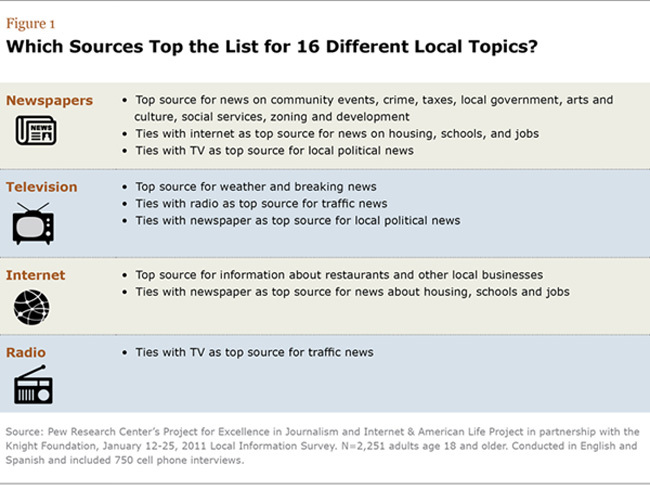 primarily print) rank first or tie for first as the source people rely on most for 11 of the 16 different kinds of local information asked about—more topics than any other media source. For adults generally, the internet is a main source for information about restaurants and other local businesses, and it is tied with newspapers as a top source for material about housing, jobs and schools—all areas that place a special value on consumer input.